Lippmannian Device's Source Clouds: Which actors appear sympathetic to a particular issue? Lippmannian Device's Issue Clouds: Which issues appear sympathetic to a particular actor? Example: Multiple issues or key words and single source (Digital Rights Issues and Publicknowledge.org). Second Example: Multiple issues and single source (Greenpeace's issues). Example: Multiple issues and multiple sources (The Global Human Rights Issue Agenda examined). This tool does not answer all of Lippmann's calls, though it seeks to begin with them by addressing a seminal Lippmannian sense as well as an extended one. It also advances the calls by Lippmann, in an attempt to enrich the partisanship notion with the idea of issue commitment by both actors to issues, and issues to actors. First, the seminal Lippmannian device shows source partisanship or commitment for a single issue. The advanced Lippmannian device shows source partisanship or commitment for multiple issues. Second, to the source clouds described above, added to the Lippmannian notions (and to the device) is the means to render issue clouds, showing which issues resonate most with one or more actors. Query a set of actors' websites for an issue, and see which actors acknowledge it. Do so with the source cloud analysis, and show sources on a map that acknowledge an issue. The questions may be posed in the plural, too. Which actors appear sympathetic to a particular issues? Query a number of issues in an actor's website, and see how often the actor acknowledges it. These are issue clouds. Additionally, one may ask whether a set of actors acknowledge a set of issues. Which issues are acknowledged by multiple actors? Show the partisanship or commitment of sources to issues. The cloud displays sources, each resized according to the number of mentions of a particular issue. For example, where does Craig Venter appear in the synthetic biology issue space? The Venter source cloud shows his resonance per source in the synthetic biology space. As another example, which climate change sources mention climate change skeptics (by name), and which sources do not? The climate change source cloud shows the relative resonance or impact of the skeptics. Case: Synthetic biology. Show the quantity of mentions of Craig Venter in a set of sources on synthetic biology, e.g., the top 100 Google returns for the query, "synthetic biology." Goal: Show the impact of Craig Venter in the synthetic biology issue space. Set Google preferences to return 100 results. Query "synthetic biology" in Google. Select and copy top 100 Google results. That is, on the Google results page, select all and copy. Avoid the sponsored results and the image results. Consider avoiding the news results, youtube results and wikipedia. Optional and advisable step. Should one wish to view the URLs that will be queried in the Lippmannian Device, paste the 100 Google results first in the harvester, a separate tool athttp://tools.issuecrawler.net/beta/harvestUrls/. Consider choosing output 'only return hosts' and 'only return uniques,' which means unique hosts will be returned and later queried, i.e.,http://www.synbioproject.org, not http://www.synbioproject.org/topics/synbio101/. Paste the top 100 Google results in the top box of the Lippmannian Device. If Google results are entered, and the optional step 3 was avoided, note that Lippmannian Device will strip out the text, and query only the URLs. In the bottom box of the Lippmannian Device, enter the key word, Venter. Select the number of desired results (1-1000). Use higher quantity of results if there is an expectation that most sources mention the key word. For the Venter case, use 200 results. Name the output file, and press Scrape Google. Keep the Google Scraper window open, and wait until the scrape is completed, i.e., until the results file is written. View results of source cloud - multiple sources and single issue. View different orderings. Choose cloud output 'ordered by size' for a hierarchy of sources mentioning Venter, with those sources mentioning venter the most at the top. Choose 'order of input in Google Scraper' to view how close to the top of the Google returns the issue resonates. For a case where such a view is desirable, see source cloud, sources per issues (the advanced Lippmannian Device). Figure one: Craig Venter's presence in the Synthetic Biology issue space, March 2008. Top sources on "synthetic biology" according to a Google query, with number of mentions of Venter per source. Output by the Lippmannian Device, Digital Methods Initiative, Amsterdam. Goal: Show the impact of the climate change skeptics in the climate change issue space. Set Google preferences to return 100 results. Query "climate change" in Google. Optional and advisable step. Should one wish to view the URLs to be queried in Google, paste the 100 Google results first in the harvester, a separate tool athttp://tools.issuecrawler.net/beta/harvestUrls/. Choose as output 'only return hosts' and 'only return uniques,' which means unique hosts will be returned and later queried, i.e.,http://www.epa.gov, not http://www.epa.gov/climatechange/kids/index.html. In the bottom box of the Lippmannian Device, enter the key words, i.e., a list of climate change skeptics, one per line. Select the number of desired results (100-1000). Use higher quantity of results if there is an expectation that most sources mention the key word. For the climate change skeptics, use 100 results. Name the output file, and press Scrape Google. View results of source cloud. View multiple sources and single issue for a source cloud of each skeptic. View multiple sources and multiple issues for a source cloud of all skeptics. View different orderings. Choose cloud output 'ordered by size' for a hierarchy of sources mentioning one or more skeptics, with those sources mentioning one or more skeptics the most at the top. Choose 'order of input in Google Scraper' to view how close to the top of the Google returns the skeptic or skeptics resonate. Figure two: Climate change sources acknowledging climate change skeptics. Top sources on "climate change" according to a Google query, with total number of mentions of climate change skeptics by name (Timothy Ball, Sallie Baliunas, Robert Balling, Paul Driessen, Sherwood Idso, Richard Linzen, Patrick Michaels, Steven Milloy, Frederick Seitz, Fred Singer and Willie Soon). Output by the Lippmannian Device, Digital Methods Initiative, Amsterdam. Show the issue commitment or partisanship of a single source or multiple sources. The cloud displays issues, each resized according to the number of mentions by one or more sources. For example, of all their issues, which ones are most mentioned by the U.S. digital rights organization, Public Knowledge. As an example of multiple issues and multiple organizations, which issues are the most significant among the global human rights organizations? Show the global human rights issue agenda, ranked. Case study: Public Knowledge, an organization dedicated to digital rights. 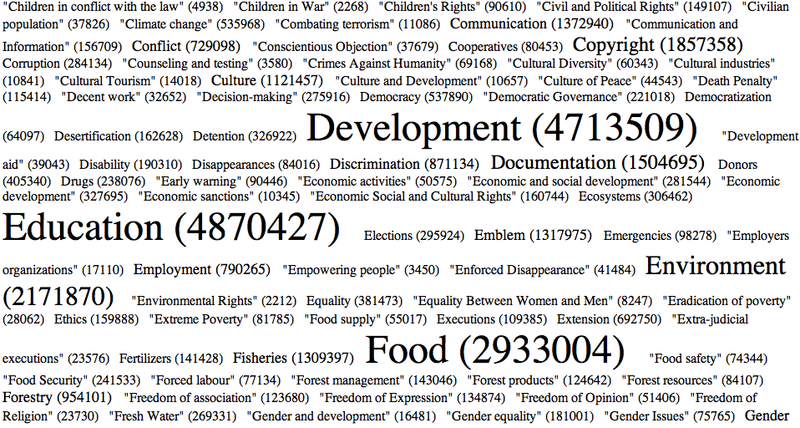 Show the quantity of mentions of each of the issues by Public Knowledge. Goal: Show the distribution of commitment to digital rights issues by Public Knowledge. Find an organization's issue list. Public Knowledge's issue list is here, http://www.publicknowledge.org/issues. "Digital Millennium Copyright Act" OR DMCA. "700 MHz Spectrum Auction" OR "Spectrum Auction"
Place Public Knowledge's URL in the top box of the Lippmannian Device, http://www.publicknowledge.org. Select the number of desired results (1-1000). Use higher quantity of results if there is an expectation that the source mentions the issues in great quantity. For the public knowledge case, use 1000 results. Name the output file (e.g., publicknowledge_issues_2oct2009), and press Scrape Google. View results of issue cloud. View issues per source. View different orderings. Choose cloud output 'ordered by size' for Public Knowledge's issue hierarchy. Figure three: Public Knowledge's issue commitment. Lower six issues on Public Knowledge's issue list, ranked according to number of mentions of issues on publicknowledge.org, 2 October 2009. Output by the Lippmannian Device, Digital Methods Initiative, Amsterdam. Case study: Greenpeace, an organization dedicated to environmental issues. Show the quantity of mentions by Greenpeace of each of its own issues. Goal: Show the distribution of commitment to environmental issues by Greenpeace. Copy and paste issue list to bottom box of the Lippmannian Device, one issue per line, placing quotation marks around multiple-worded issues. Keep most significant issue language. Place Greenpeace's URL in the top box of the Lippmannian Device, http://www.greenpeace.org. Select the number of desired results (1-1000). Use higher quantity of results if there is an expectation that most sources mention the key word. For the greenpeace case, use 1000 results. Name the output file (e.g., greenpeace_issues_11oct2009), and press Scrape Google. Keep the Google Scraper window open, and wait until the scrape is completed. View different orderings. Choose cloud output 'ordered by size' for Greenpeace's issue hierarchy. Figure four: Greenpeace's issue commitment. Greenpeace's campaign issue list, ranked according to number of mentions of issues on greenpeace.org, 11 October 2009. Output by the Lippmannian Device, Digital Methods Initiative, Amsterdam. Goal: Show the global human rights issue agenda. Which issues are most mentioned, and which are relatively neglected? Find lists of significant human rights organizations. Whilst one may employ the Open Directory Project ( dmoz.org) or Yahoo's directory, in this case study, researchers choose three lists of significant human rights organizations appearing on Amnesty International's site, the United Nations' site dedicated to the 60th anniversary of the Universal Declaration of Human Rights, and Choike, the portal of southern civil societies, sub-category human rights. Triangulate organizations on the three lists, retaining those human rights organizations listed on two of the three lists. Use triangulation tool,http://tools.issuecrawler.net/beta/triangulate/. Visit the Websites of each organization retained after triangulation, and make a long list of all human rights issues that each organization highlights in their issue lists. Retain specific issue language as well as unique issues. Consider removing issues that appear on only one or only two sites. This is time-consuming work. Place the URLs of the triangulated organizations in the top box of the Lippmannian Device. Place the human rights issues in the bottom box of the Lippmannian Device, one per line, placing quotation marks around multiple-worded issues. Select the number of desired results (1-1000). Set a higher quantity of results if there is an expectation that most sources mention the key words. For the global human rights case, use 1 result. 1 result is chosen because of the size of the query (tens of organizations and hundreds of issues). In this case, the researchers rely on the estimated Google results. Name the output file, and press Scrape Google. View results of issue cloud. View multiple issues and multiple sources (sources per issues estimated by Google) for an issue cloud of the global human rights agenda. View different orderings. Choose cloud output 'ordered by size' for a hierarchy of issues per source mention. Choose alphabetical listing for comparisons of similarly termed issues and their resonance across the global human rights source set. Figure five: Global human rights issue agenda. Global human rights actors' issues, ranked according to the estimated number of Google mentions on a set of global human rights actors' websites, 31 March 2009. Output by the Lippmannian Device, Digital Methods Initiative, Amsterdam.